Reveals to your customers the importance you give them! This modular solution, optimises the customer relationship, facilitates and improves your logistics! Present on your documents (invoices and/or delivery slips) important messages. What's more important than going up to your customers that they are important and unique to your eyes! Thanks to the Order message in PDF module you create a direct trust relationship with your customers. As a first step, by offering the ability to view customer messages on your documents. This is the guarantee for your customers that you consider their requests. 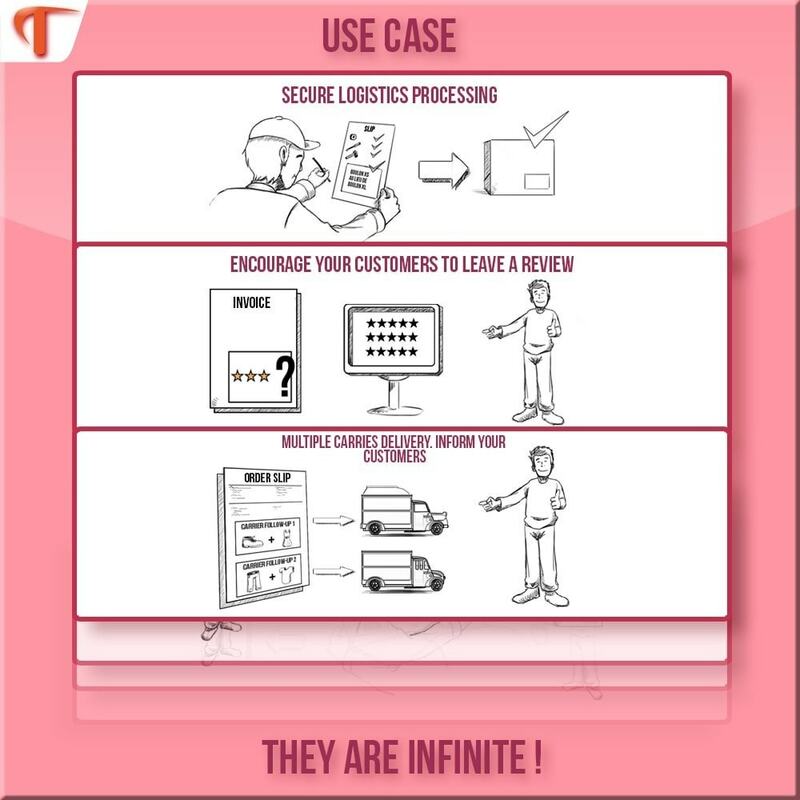 Then, by facilitating the logistical processing of the orders, allowing the teams to leave messages to the customers. Finally, by adding internal messages on the delivery voucher you make sure you have a good preparation of the orders: you secure your logistical treatment without any loss of information. Display the messages on the invoice and/or delivery order. Select the message sources (customer or internal message). Set the number of visible messages. Personalize with a few clicks the visual presentation of the messages on the documents. You can change the main graphics and formatting elements of the messages to best fit your graphic chart. So you have a hand on how the messages will appear. At any time, you can view the rendering of your documents, thanks to our PDF preview feature. 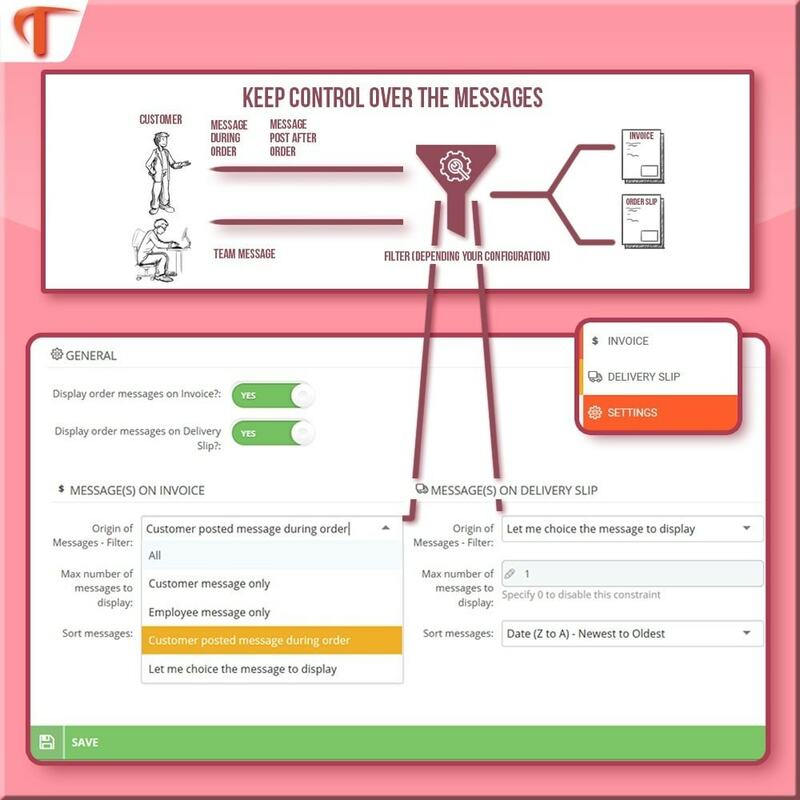 Fine message Management by the filter feature that offers many options (client messages only, employee messages, or the ability to manually select messages). With manual message handling, you have directly in the command interface of a block to select the messages and the document where they will be visible. You keep a total control of the messages presented. By presenting customer or internal messages on your documents, you reassure your customers about the importance you give them. The usage of Order Message in PDF is endless! The customer orders two products supplied by two manufacturers. For all your deliveries in dropshipping or requiring two carriers, you can tell the customer on his invoice the tracking codes of each carrier. Advantage: An efficient and personalized customer relationship! The client orders a model with a specific declination. 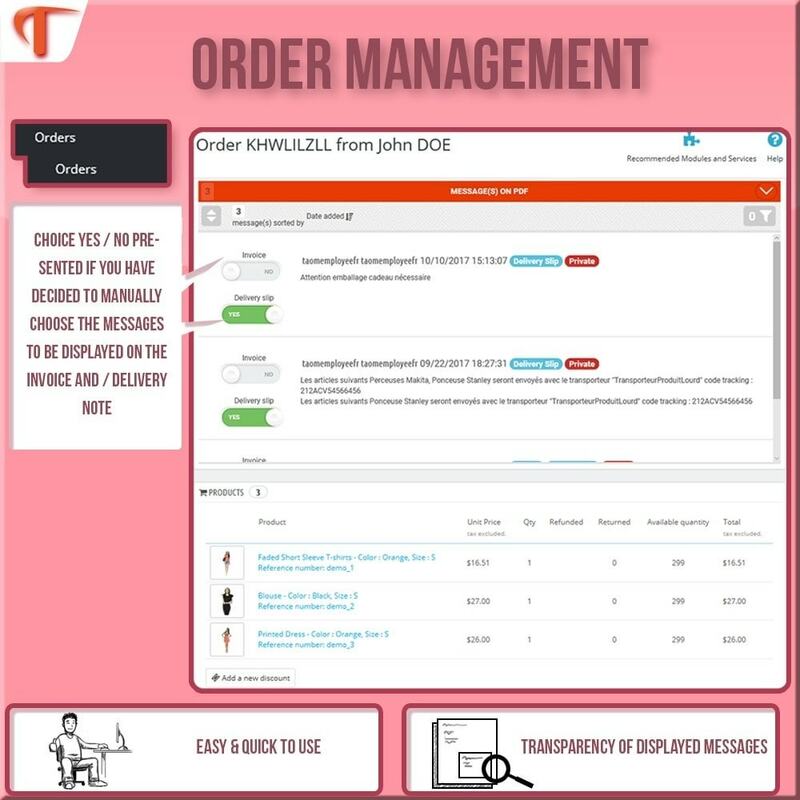 When processing the order, your teams add a message on the delivery order to ensure the customer's request is well taken into account during the preparation of the order. Advantage: Securing logistical treatment without loss of information between your team members. The customer passes an order thinking that all the items are in stock and that it will therefore be delivered within the announced time. It may be that the stock displayed on the front does not correspond to the reality. To comply with your commitments, you can decide to deliver in 2 times and therefore to indicate on the delivery voucher that there is a balance of order which will be the subject of a second delivery. Advantage: The satisfaction at the center of the customer relationship. Set up a predefined message on each of your bills or delivery slips to encourage your customers to leave a notice. Advantage: Customizing the customer relationship. The customer asks you to add a card with the message "Happy Birthday". Your logistics team responds on the invoice that the personalized card has been added. The recipient receives the parcel without the messages appearing on the delivery voucher. Advantage: Securing logistical treatment and custom management of orders. 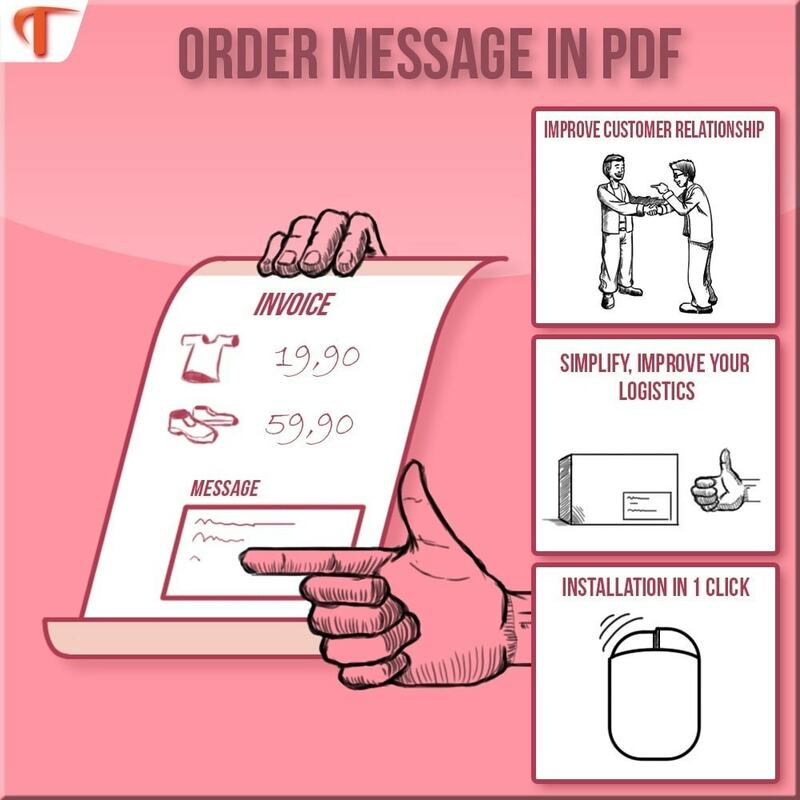 As you can see, the use cases of Order message in PDF are unlimited and meet your marketing and commercial objectives. The reference module for an efficient customer relationship and a top logistics! This module is perfectly integrated with Prestashop and can be accessed from the "Message command in PDF" tab. Ready to use Module as soon as the installation. One-click Installation. Quick and intuitive setup and personalization. In the Order Administration tab, a new "messages in PDF" block appears, allowing you to seamlessly view the messages that will be presented on your documents. If you have set the "Choose my messages to display" option, this block selects the messages presented. This richness of the settings gives Order message in PDF a flexibility of use and a total control of what you want to show. The module that shows your customers that they are important and that you want to create a real relationship of trust. Your customers feel they are being listened to and this promotes customer loyalty. The installation of the module is simply: Installation in one click! The administration and configuration of the module can be accessed from the "Order message in PDF" tab and take no more than 5 minutes.